Our Vermont inn’s common areas offer you a variety of beautiful, charming places to feel “at home.” Calming views of the White Mountains from covered porches to relaxing sitting rooms with soft music and cozy fireplaces — all designed to make a delightful vacation in Vermont so easily achievable. You will discover a wonderful library of books and games — especially our extensive collection of STAVE puzzles! 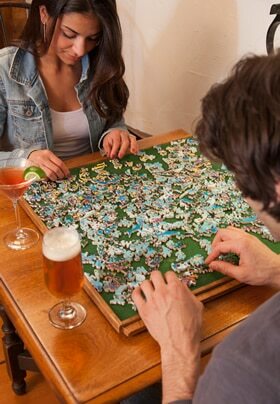 (known as the “Rolls Royce” of puzzles). Be warned, these hand-crafted, mind-boggling treasures are quite addictive! In the mood for a movie? We have a couple of 15″ LCD DVD/TVs available on a first-come, first-served basis. Choose from our movie collection or bring your own to enjoy. Join the fun in the Snooty Fox Pub, offering an array of alcoholic and non-alcoholic drinks along with good cheer and conversation with other guests or the innkeepers. 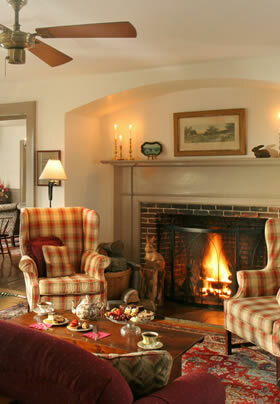 Rabbit Hill Inn sits on 15 acres in our tiny hamlet. Make your way through the gardens and over to our spring-fed pond. A small gazebo in a field of green provides a space to read a book or just listen to a waterfall. A trail map will guide you over our grounds whether it be for an early morning walk or for some back-woods snowshoeing.